The Rite in the Rain Waterproof Notebook 146 is a true go-anywhere, anytime, in-any-weather notebook, that is conveniently sized to take with you on your outings. 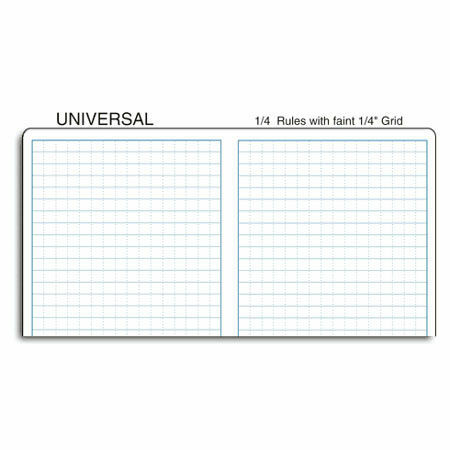 With a durable Polydura cover and the Universal pattern, these 100-page notebooks are perfect for any situation. This product has been designed for use in extreme conditions, and is manufactured with the most durable components available. This being said, the paper is totally recyclable, and the wood fibres utilised are purchased from FSC Certified sources. By doing this it insures that the product is manufactured with high environmental and social standards and practices. The hassle of soggy and illegible paperwork has plagued outdoor professionals for decades. Jerry Darling developed Rite in the Rain paper to address that problem for the Pacific Northwest logging industry in the 1920's, and the product has been evolving ever since. 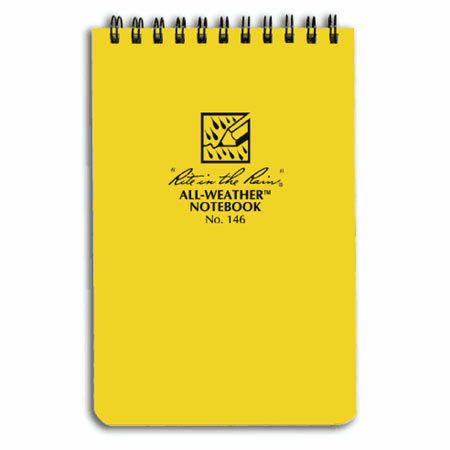 Rite in the Rain Waterproof Notebook 146 is rated 5/5 based on 11 customer reviews. This is a great little all weather notebook. It is a perfect size to put in a trouser or shirt pocket. This great little notebook which fits into the left leg pocket on fjällräven trousers. The pages could be just a little bit wider, so you could write just a little bit more. Even without that you have enough space to write down anything from a day report to a complete cast iron pot recipe. I took this with me on the fantastic Bushcraft Fundamentals course. It didn't rain and hasn't since - I have taken it on the river though - and it got wet and stood up well to that - so when it rains - I reckon it will do the job well. Woodlore's service really is second to none. They are exceptional. Great bit of kit, ideal for my possibles bag. Gave these along with a Fire Stick as a birthday present for 10+ year-olds. Great success - the boys immediately want to test the waterproofness of their notebook and start pouring liquids on top. Shame the cover isn't a bit more interesting or at least have RM on the front. Does what it says on the tin! Good size to go in your pocket. I like to keep a short pencil in the spring binding. The notebook arrived next day . I packed it the following week for the Wood Carving Course, though fortunately the weather was perfect so the waterproof test is yet to be tested! However, you can easily tell that this is an item of functional quality and a good addition to my daypack. The waterproof notebook is exactly that and for £5 it is a small price to pay to take a preventative step, protecting your notes from spills, rain and other contact with liquids (within reason). I submerged this notebook under water for half a minute or so and the pages remained strong also writable. Simply the best noterbooks I have seen for bicycle touring in all weathers. I doubt they could be improved upon. I reviewed this before but having used it 'properly' in the field I can safely say it's great. Not a smudge in sight from a 'B' pencil in heavy downpours. 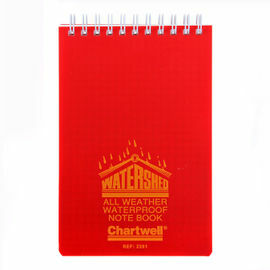 Can you use a normal pen or pencil on this waterproof notepaper or do you need a waterproof pen? A normal biro or pencil works very sufficiently on the waterproof notebooks, so there would be no need for a waterproof pen.